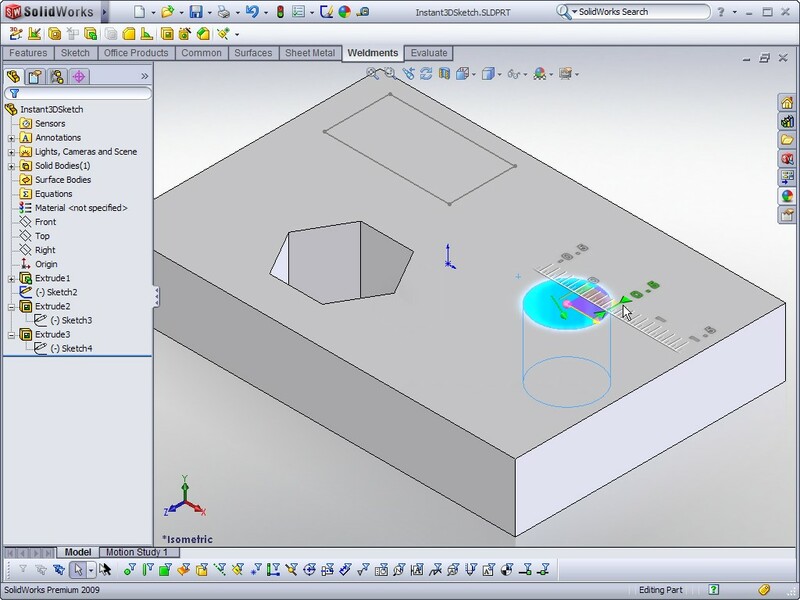 Instant3D was introduced to the SolidWorks community in SolidWorks 2008. Naturally in the first revision since then there are a few new enhancements which are sure to come in handy. Instant3D can now be utilized in Assemblies! Using Instant3D you can modify assemblies sketches, features, & mates! It works pretty much the same as it does in part files. SolidWorks 2009 also introduces some new ways to manipulate closed contour sketch geometry using Instant3D. You now have a 2D coordinate axis that is available to drag geometry along axis directions. This seems to be best for concept work where you don’t have many relations or dimensions defined in the sketch. If you try to pull a feature based sketch by one of the axis and there is a relation holding it in that direction, SolidWorks gives you the option to delete that relation. Instant3D has now made its way into the Weldment functionality. You can click and drag faces of Weldment Structural Members and set the change using the Instant3D Ruler. Thanks to a tip from Matt Rece (the SolidWorks TTM from my area), here is a bit of an “undocumented” addition to Instant3D. You can now use Instant3D to change Offset, Translation, & Rotation based Move Face commands! Once you have created the command you can click the face that has been moved and drag the Instant3D arrow to re-adjust. Click the Image Below to view a video demonstrating these new Instant3D features. Stay tuned…more to come tomorrow! Ricky Jordan’s Blog has moved! Ricky, I agree with Neil – nice video. We are still on SW'07 here so seeing some of the new functionality presented in this way really helps me to understand it better – thanks! Question though: have you found more errors in your designs because of the ability to move features around on the fly like that? Seems like someone could change a dimension they weren't supposed to without realizing it. We are still on SW’07 here so seeing some of the new functionality presented in this way really helps me to understand it better – thanks! Question though: have you found more errors in your designs because of the ability to move features around on the fly like that? Seems like someone could change a dimension they weren’t supposed to without realizing it. Like Chris above, we've stuck with 2007 and skipped 2008 entirely. Your previews of 2009 have offered great insights for this new release, which we intend to run. Neil – I think no matter how hard you try there will always be a few undocumented features in a release. I know where you are coming from on this and I agree – the documentation needs to get better. If you have dimensions in a sketch that fully define it you have to click on the “blue dot” on the dimension leaders to adjust the size. This of course is only available when Instant3D is enabled. The blue dot is pretty small and requires much more precision by the user to use the Instant3D functions vs. an underdefined sketch which can be dragged around and resized across a much larger selection zone. Because of this I don't find Instant3D to be a problem when it comes to accidental changes. I now leave it turned on all the time in SolidWorks 2008 & SolidWorks 2009 and have not had any issues. Thanks for the comments guys…keep em coming! Like Chris above, we’ve stuck with 2007 and skipped 2008 entirely. Your previews of 2009 have offered great insights for this new release, which we intend to run. If you have dimensions in a sketch that fully define it you have to click on the “blue dot” on the dimension leaders to adjust the size. This of course is only available when Instant3D is enabled. The blue dot is pretty small and requires much more precision by the user to use the Instant3D functions vs. an underdefined sketch which can be dragged around and resized across a much larger selection zone. Because of this I don’t find Instant3D to be a problem when it comes to accidental changes. I now leave it turned on all the time in SolidWorks 2008 & SolidWorks 2009 and have not had any issues. How does Instant 3D work on imported geometry? 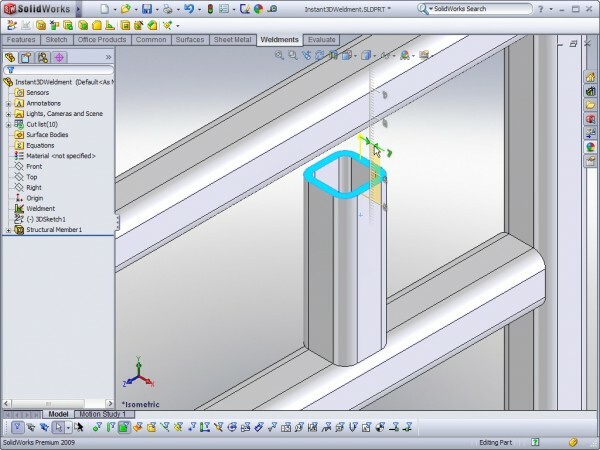 Modification of imported geometry is best performed with a combination of tools in SolidWorks. When I work with imported data I often use a combination of Delete Face, Move Face, Surface Fill, Boundary Surface, and a number of other surface generation tools. 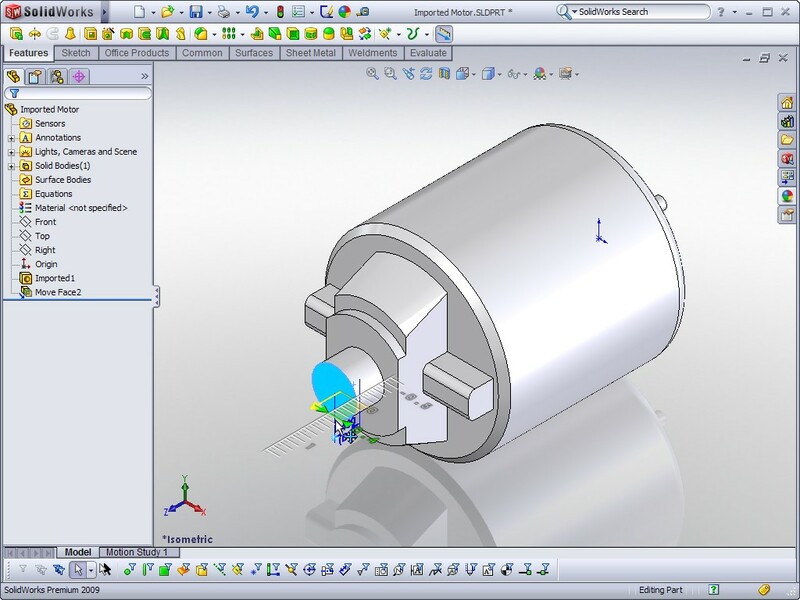 Instant3D is currently intended to be used primarily on SolidWorks models with parametric features. (The exception is Fillet recognition with FeatureWorks active.) Many in the SolidWorks Community believe that direct editing features added in future releases will fall under the Instant3D banner. 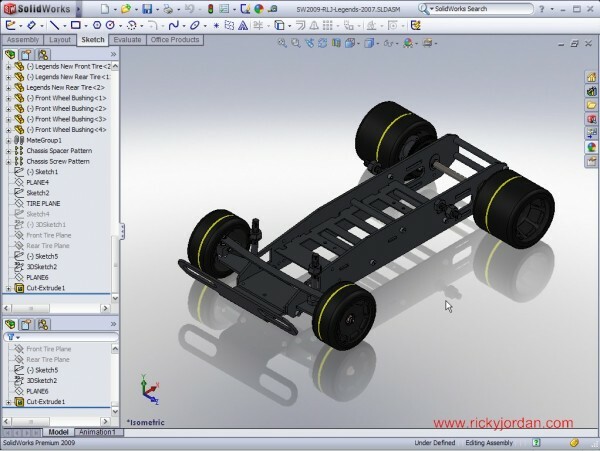 Ricky, it sounds like it's really a major hassle to work with imported geometry in Solidworks. For those who work mainly with imported geometry is SolidWorks the wrong tool to use? It's not a major hassle but I certainly would like to see some tools added in the future that would allow a little more freedom when it comes to modifying imported geometry. A lot of it really depends on the geometry you are trying to modify and what specifically you are trying to accomplish. 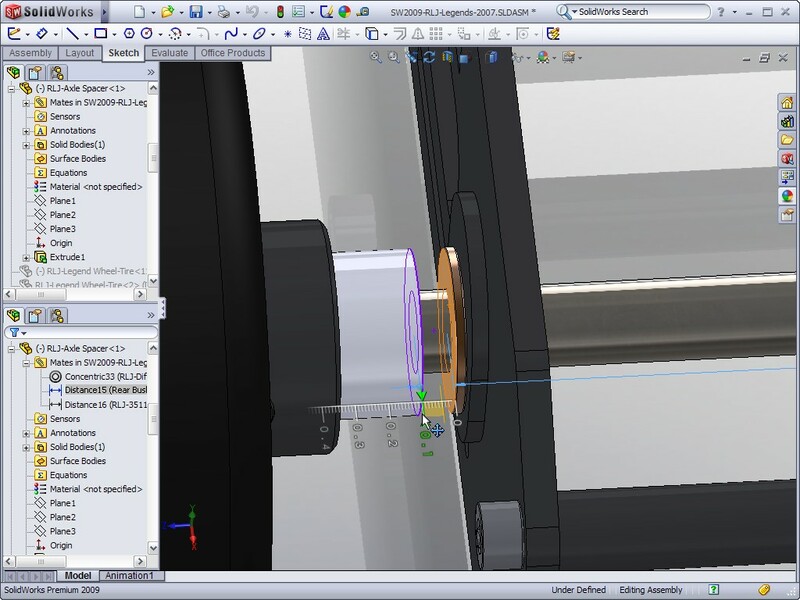 If you are making some basic tweaks such as adding/removing holes, adding draft, fillet reworking, & moving faces then SolidWorks is a very effective tool for the job. There comes a point when the modifications become so numerous that you are often times better off remodeling the part from scratch. The biggest improvement I would like to see in SolidWorks is some re-parametrization tools that allows for more direct editing when you get an imported file that has internal accuracy issues. This is where you see move face and delete face commands sometimes fail. I think the Move Face and some of the other direct editing tools could use some improvement in from a UI standpoint as well. Ricky, it sounds like it’s really a major hassle to work with imported geometry in Solidworks. For those who work mainly with imported geometry is SolidWorks the wrong tool to use? It’s not a major hassle but I certainly would like to see some tools added in the future that would allow a little more freedom when it comes to modifying imported geometry. Thanks for great blog posts+great comment replies. can you explain what “internal accuracy issues” are? + i have always wanted to know why there are flaws to imported/exported geometries although they are according to a Standard format (iges,step,…) and seemingly both cad systems support that standard? Instant3D the rulers of the screen when I asked about their accuracy. I asked what is to keep users from arbitrarily creating models without taking into account the values of being selected. This is definitely a possibility, and probably going to happen with less experienced users, but the rulers of the screen allows precision without extra steps.